This light and functional bathroom in traditional style belongs to a young man. 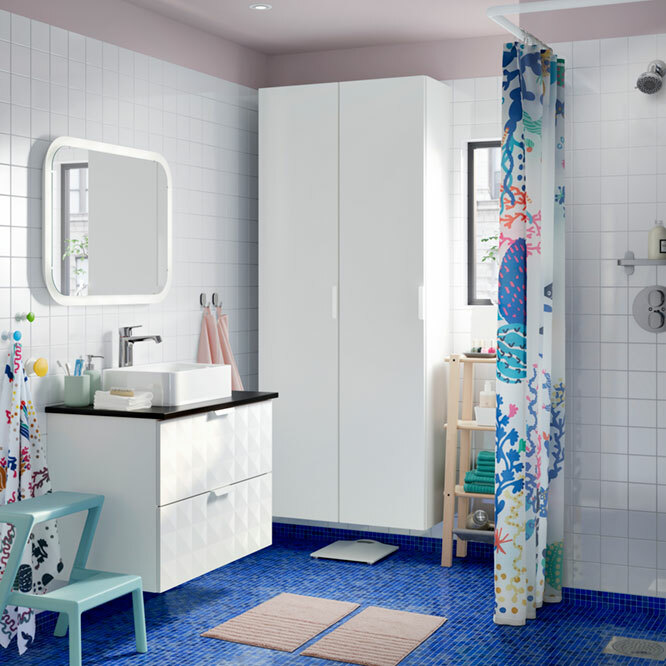 It has all basic functions: from shower curtains hung in the corner (they serve for a shower cabin) to the HEMNES bathroom furniture that help save space and make everything in this bathroom easy to see, grab, and store. 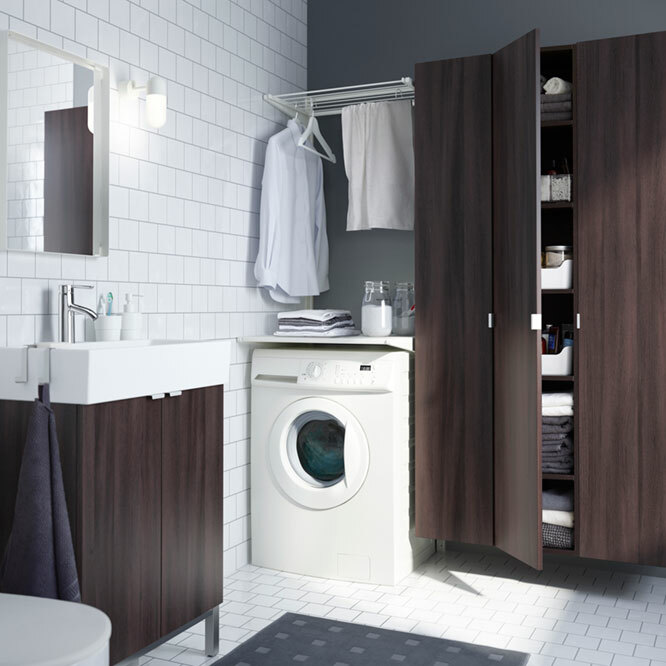 With GODMORGON your bathroom, big or small, will become a restful retreat to start and end your day in. 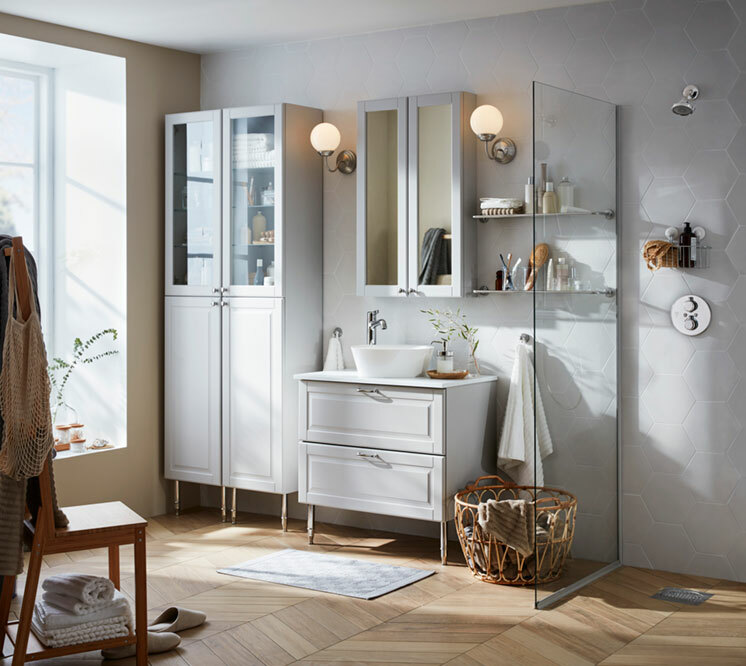 From high cabinets to mirror cabinets to wash stands with drawers, all furniture is designed to keep this traditional style bathroom tidy and organised. And the RÅGRUND towel rack chair comes in handy when you don't have hooks for wet towels or bathrobes. When you want to have more storage space in a small bathroom, choose the low-price DYNAN bathroom furniture. 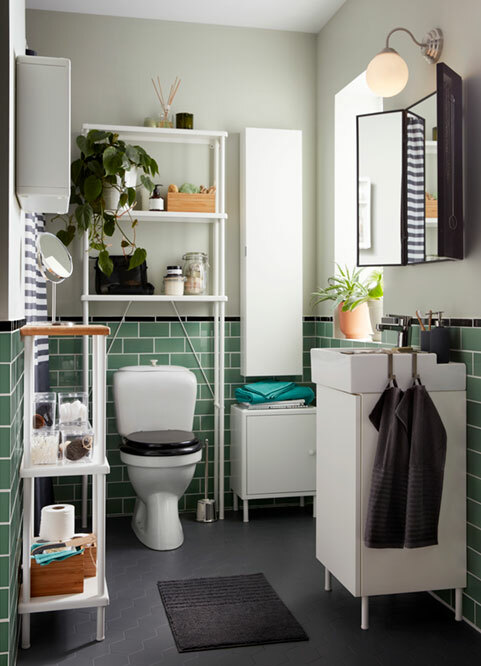 The open shelving units fit perfectly above your toilet and transforms an unused wall space into a practical storage space for toilet paper, bottles and cleaning detergents. The shelves are wide and shallow – two features which create a lot of space for your things and also give you more floor space to easily move around. How to furnish a bathroom without spending a lot? The traditional style SILVERÅN bathroom furniture might come in handy. 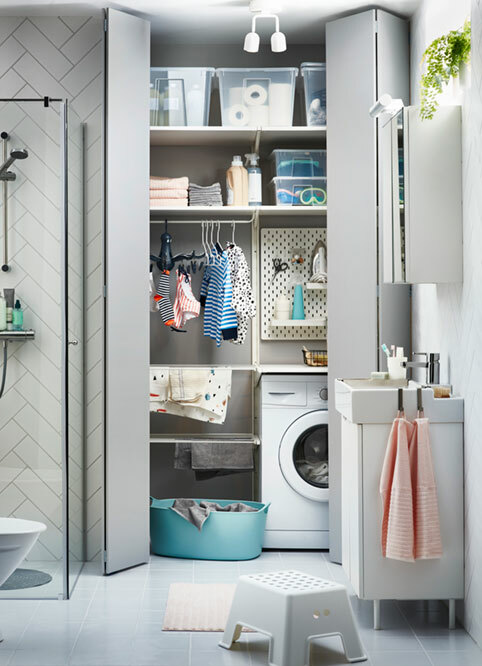 Choose from a wide range of shallow high cabinets for cosmetics, wash-basin cabinets, mirror doors and storage benches with plenty of room inside to store and organise your towels (or to sit down and rest for a while). As for style? 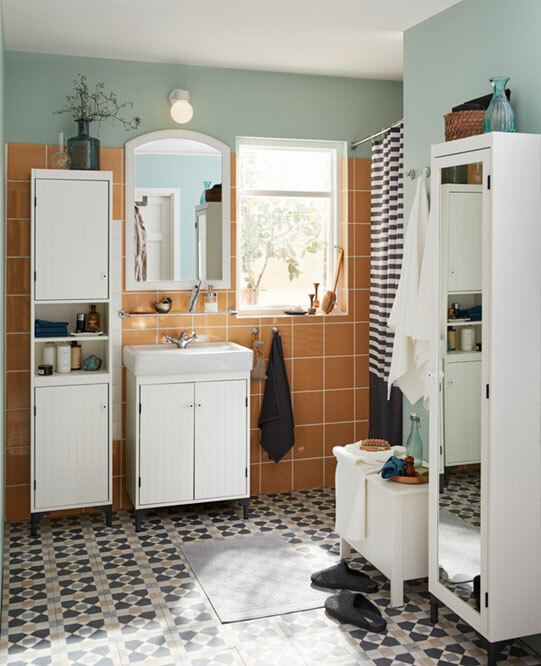 Subtle stripes from cabinet doors – and not so subtle ones from shower curtains bring this bathroom to life. Even if a bathroom is small on size, it can be big on comfort and style. 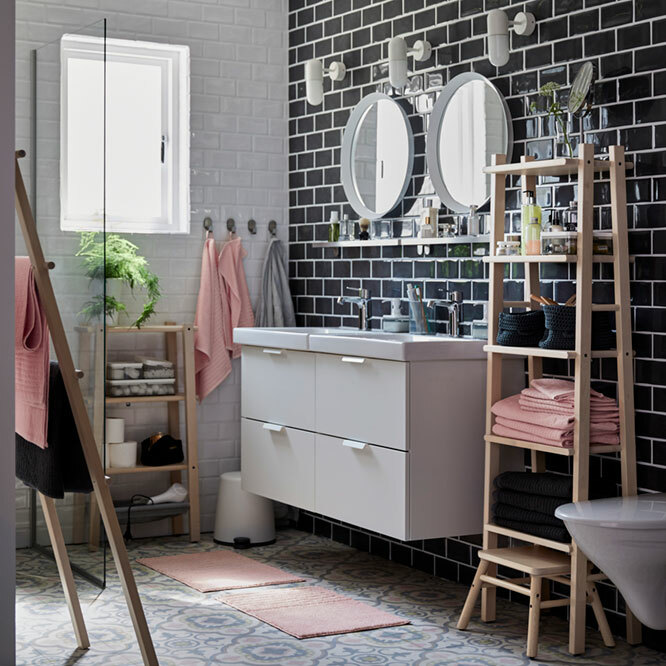 A second bathroom can be furnished with modern style low-price furniture, like DYNAN open shelves or LILLÅNGEN cabinets, wash-basins and mirrors. A step stool for kids might also be useful. And to bring more joy to your bathroom, add some colourful wall tiles and bath towels. This small bathroom features a black-and-white interior with some pastel accents. The bathroom furniture and accessories were chosen to make enough space for two to get ready each day: there you can see a double wash-basin with two GODMORGON cabinets, also two mirrors and even two bath mats. There also are some hooks, a wooden shelving unit and a VILTO towel stand for all couple's bath towels. 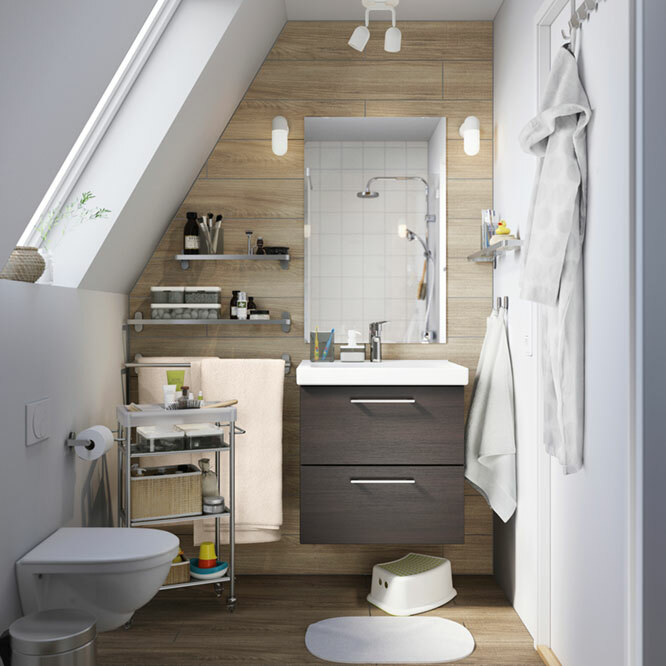 A modern style bathroom fits anywhere, even under a sloped ceiling. To set up this one, we have chosen a big, space-expanding mirror and a space-saving furniture, like GODMORGON cabinets, wall shelves and a GRUNDTAL trolley. Not to mention the hooks for towels and bathrobes and a FÖRSIKTIG children's stool that helps reach the wash-basin. The room is divided into two areas: a bathroom area with LILLÅNGEN bathroom furniture in white and a small yet functional laundry station behind the almost invisible door. The laundry station has all it takes: a washing machine, a flexi laundry basket, shelves and storage boxes for household utensils and a pegboard for other small accessories. This fresh and functional bathroom is furnished with GODMORGON bathroom furniture. One of them is a high cabinet in the same colour as the walls. It is perfect for all familys's bath towels and laundry bags. The other cabinet hangs under the wash-basin and has smooth-running and soft-closing drawers with pull-out stop. A STORJORM mirror with integrated lighting gives a diffused light and playful shower curtains make bathing funny for the smallest ones. Living small doesn't mean your bathroom cannot be cosy, stylish and functional. When you are single, a small area can easily contain all it takes to live comfortable: a bathroom furniture for the most necessary things (like LILLÅNGEN mirror or wash-basin cabinets), a shower area separated with shower curtains and some bold accents, like colourful towels or patterned bathroom tiles, to make life more interesting. Make laundry a part of your modern bathroom style. 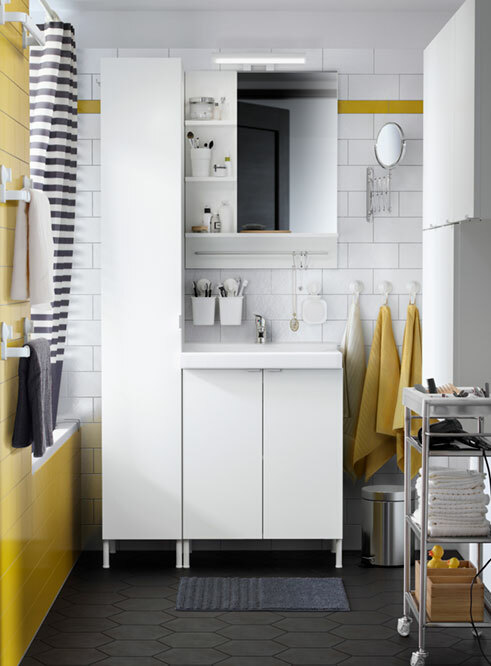 With LILLÅNGEN high cabinets, this couple has plenty of room for their bath towels, household chemicals and cosmetics, and the wall upright/drying rack above the washing machine makes clothes drying super easy. To furnish a bathroom for kids and adults, choose the modern style LILLÅNGEN cabinets: a wash-basin cabinet, a mirror cabinet and a high cabinet with adjustable feet that make it possible to compensate any irregularities in the floor. You can also add a GRUNDTAL trolley for most frequently used items, such as bath toys.